Every time you borrow money, you’re robbing your future self. Before 1970 - word EMI was not existing. So was word - Stress. By investing in SIP...you are actually CREATING a corpus wherein you can buy ASSETS with your own instead of BORROWED future earnings which can be hugely stressful. An EMI will do the reverse......your money is GONE....the asset you bought is depreciating and the all the future earnings are not being enjoyed by you but going to service the EMI. By the time your EMI ends (normally 3-5 years), the price of the vehicle would have become more or less ZERO due to depreciation and you need to go for an EMI again!! 3. 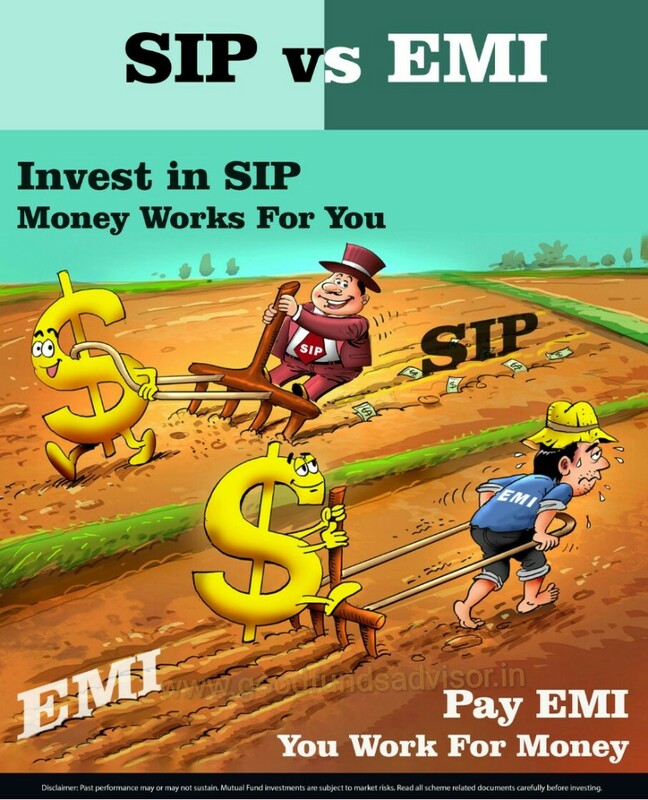 A Sip can always be STOPPED in between in case of any financial difficulties you may have but an EMI cannot be stopped. If you skip paying any EMI...the charges and penalty are levied and you are burdened even more!! What kind of person you are, determines which to choose. Do not stop your SIPs during times when market comes down. Keep continuing your SIP. You get allocated max units when market comes down. Which, in turn, gives you the highest return when market goes up, which it eventually does. 1. in Developing Financial Discipline by inculcating the habit of SAVING. 4. NO need to worry about Market Levels as SIP buy MORE at lower levels and buys less at Higher levels. 6. VERY IMPORTANT - WITH AN EMI, YOUR COST IS ALWAYS HIGHER. WITH A SIP, YOUR COST OF A PRODUCT THAT YOU PURCHASE IS ALWAYS AT ACTUALS and sometimes even at a Discount as a Seller always prefers Immediate Money and Later Money (like an EMI). 9. Control over Asset Allocation. If you are indeed going for an EMI....it only shows that your Financial Planning is not proper. If planned prudently with the help of a Good Advisor, then EMI should never be a part of your life. Never.